If a friend owes you money, or even less personal and more serious like a large amount owed, this spell will help you get your money back. Gather at least 5 coins or an amount in multiples of 5 (have all the types of coins represented). Dress a green candle (either a votive, a figural candle in the gender of the person who ows you money) or a Green Devil Candle (working from the bottom up) with olive oil, cinnamon, patchouli, wintergreen, and basil. Place it on the left side of your altar. 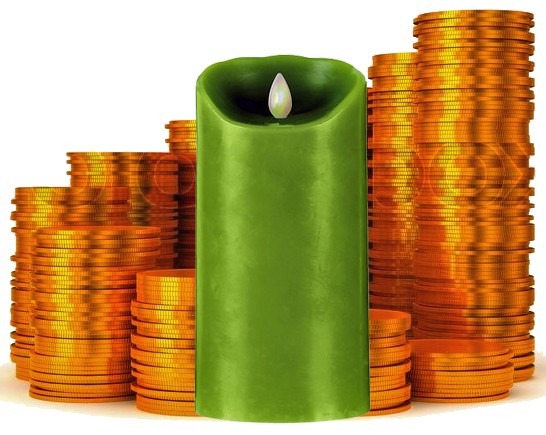 Place all the coins in spiral shape, with the spiral going toward the candle. Now fold the petition paper in 5 folds, folding towards yourself. Light the candle for 5 minutes, for 5 days, at either 5 a.m or 5 pm. On the last day, let the candle burn down. During each working, pray Psalm 23. Dispose any spell remains at the person’s house, if possible. Either bury it in the ground, in one of their potted plants, or underneath on of their bushes. If that is not possible, bury it somewhere on their street, on the side of the street that their house/apartment is one, in a way that the lane is going TOWARD their home.